Five years ago when pregnant with Big Girl, we never found out what we were having prior to delivery; the same was true with Baby Girl as well. All of our nursery stuff from before was done in blue, green and yellow and was very gender neutral. I had kept almost everything from the first baby to use with other children. With having so much on hand I didn’t want to make a bunch of stuff that wouldn’t be used often. I figured it would be better for me to wait and I could make stuff for the baby as he/she grew up. 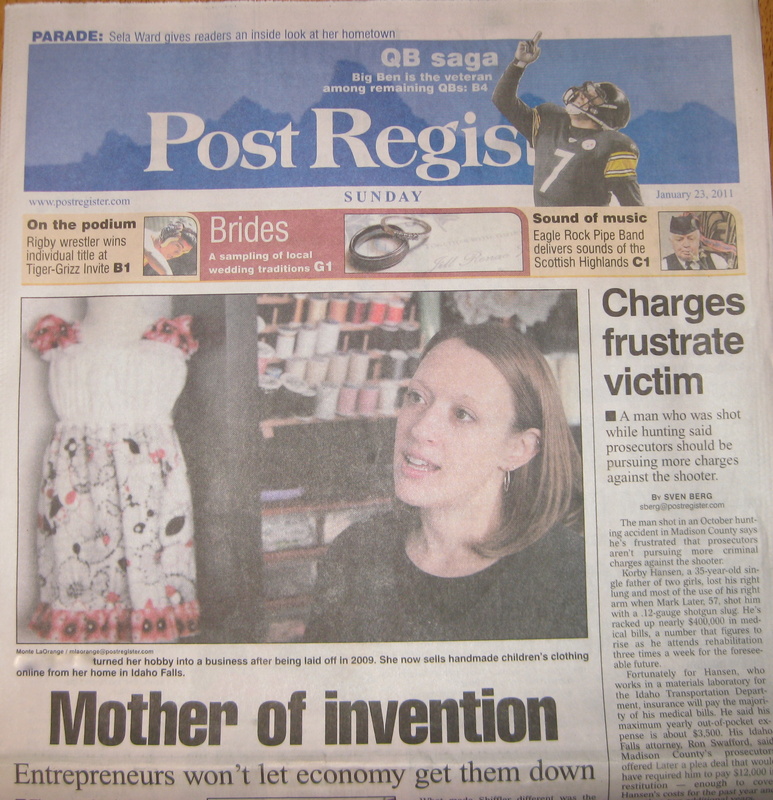 There was only one baby-related sewing project that I completed before Baby Girl made her appearance. 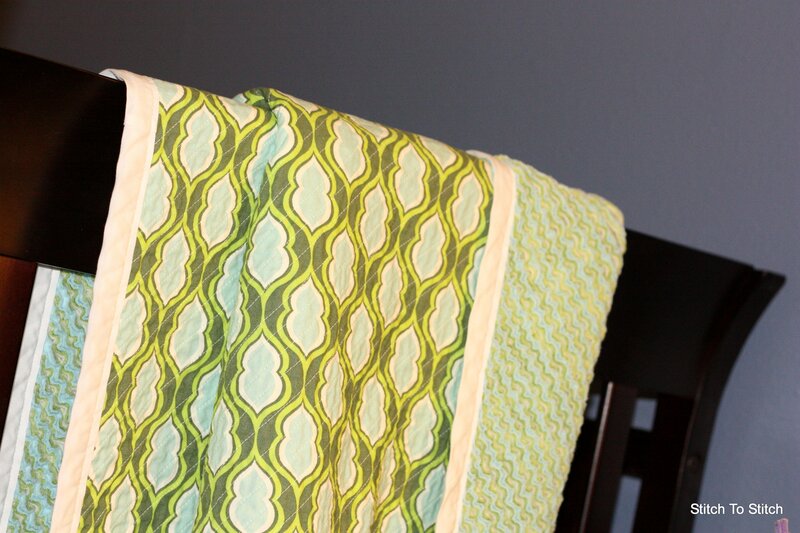 A Heirloom Cut Chenille Baby Blanket, using the tutorial from Aesthetic Nest. All in all, it was a fairly easy blanket to make. I took longer than the 4 hours Anneliese said it took her to sew all the diagonal seams but I will admit that I don’t sew very quickly sometimes. Especially when pregnant and needing to get up for frequent breaks. 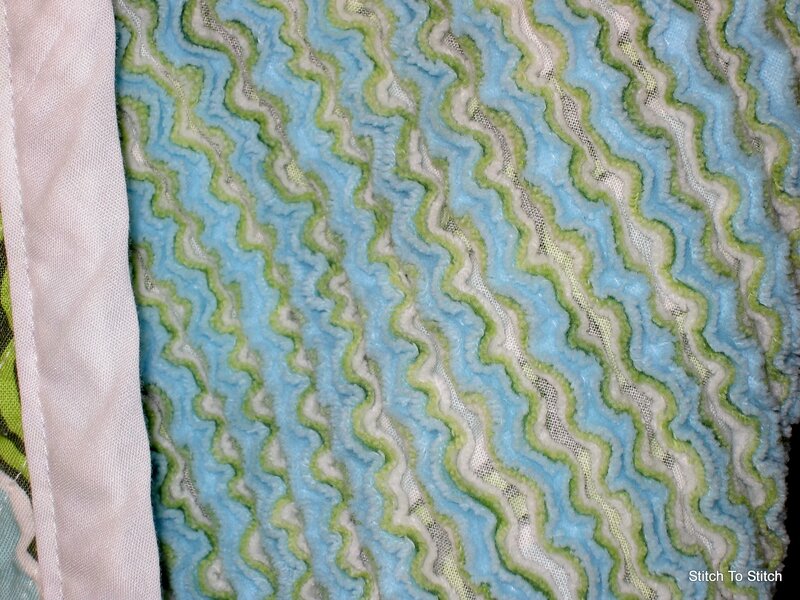 Two tips though — spend the money on an Olfa Chenille Cutter if you can (it makes the project SO much simpler) and make sure to sew on a diagonal. Or if you want to sew vertically or horizontally, make sure to turn the flannel so it’s on the bias or you’ll end up with shreds of fabric after washing. A friend of mine learned this the hard way. I was flipping through my latest copy of Sew News the other day when I came across an ad that caught my eye. It was for a handy set of reference cards to help you estimate how much fabric to buy for patterns. What a great idea! Each plastic card is the size and thickness of a credit card. The set of 6 cards is held together with a spiral ring. There is a title card, and then separate cards for dresses, skirts, pants, jackets and tops. 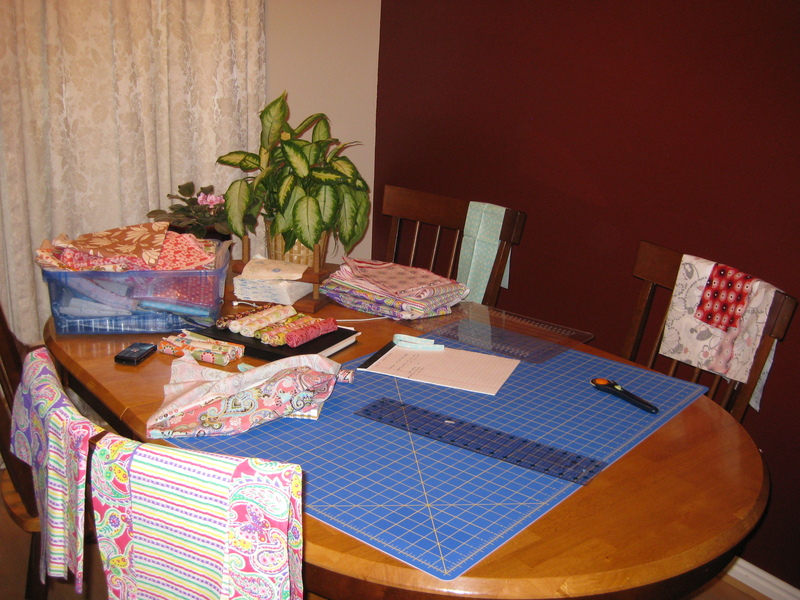 The main table on the front of each card lists minimum, average and maximum fabric requirements, broken down by clothes size and fabric width. The minimum is the smallest amount of fabric that was called for by any of the hundreds of patterns that were used to build this table. The maximum is the largest amount of fabric that was called for by any of those patterns. And the average is the average amount of fabric. Aside from the choice between minimum, average and maximum, you use this table pretty much like the table on the back of any pattern envelope. Also on the front of the card, the “Safety Margin” table helps you decide how much (if any) to round up from the average number printed in the main table. How safe do you want to be? To have enough fabric for about 75% of the pants patterns out there, you only need to add 1/4 of a yard to your average, but if you want to cover 75% of the dress patterns, you need to add 1/2 yard. Finally, the sketches on the back of each card are designed to give you an idea of what type of outfit you could make with the minimum, average or maximum amount of fabric listed in the table. The 2 average sketches (and 2 mins on the pants card) are just different styles with the same amount of fabric. The 2 maximum sketches are different – one shows the largest outfit for narrower fabric and the other shows the largest outfit for wider fabric. The dotted lines represent shoulders, waist, hips and knees. Look for trade-offs between length and fullness. 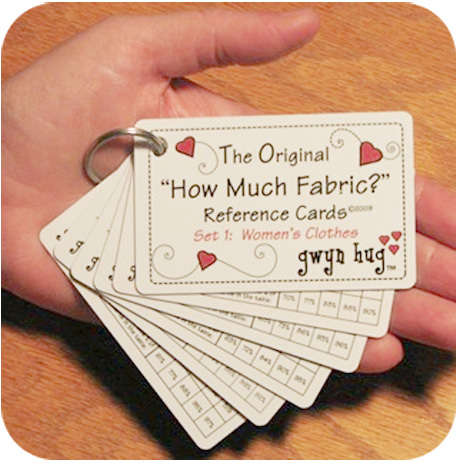 Right now there are only 2 sets of reference cards available for purchase — Women’s Clothes and Plus Sizes. I can’t wait until the Children’s set is ready for sale! There’s no need to walk around with that generic styrofoam cozy on your coffee cup anymore! 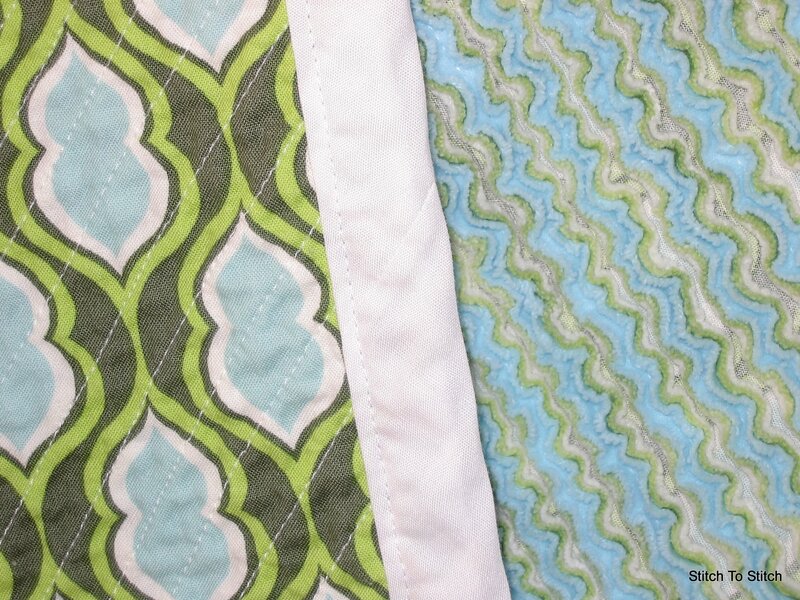 Check out this quilted coffee cozy tutorial over at Terri’s Notebook! I originally saw this adorable cozy over at Apple Tree Boutique, but she only referenced some other online tutorials. Here is Stacy’s version. Very cute! One of my most fabulous IRL friends has combined her love of baking and photography into what is sure to be an awesome business adventure! Welcome, Simple Jesstures, to the world of Etsy! The kit includes a gable box that holds 6 regular sized cupcakes, 12 coordinating greaseproof cupcake liners, 12 white cupcake liners, decorative thin cut parchment for the bottom and a recipe card. Two styles of large market trays (each holds 6 regular cupcakes) will be offered as well, in limited quantity. 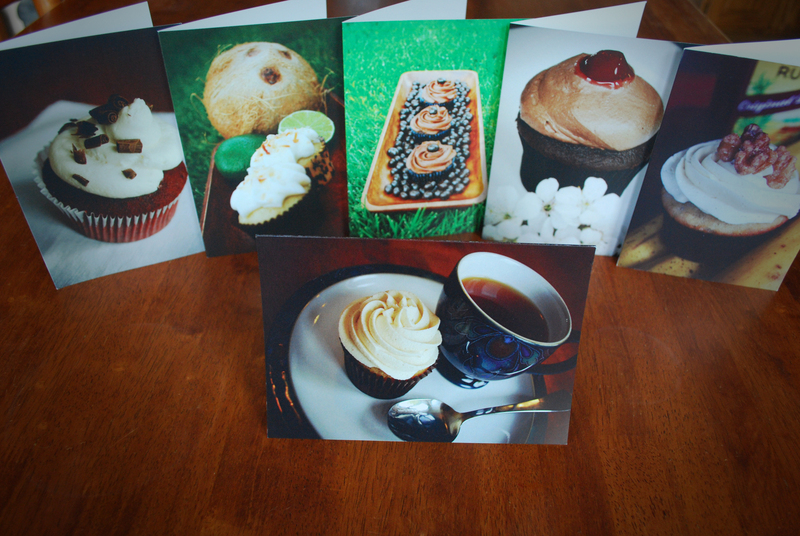 Printed as a 5 x 7 greeting card, there are 6 different cards available at this time. (photo below, flavors can be seen on her blog of Etsy page) They will be offered as sets of 6 however, if you want to purchase a single card that can be worked out. To celebrate her Grand Opening (today, July 6th!) she’s running a fantastic giveaway for a 6-pack of recipe cards. Head on over to her blog for giveaway details and make sure to enter! Your tastebuds will thank you if you’re the lucky winner! This is what keeps me sane. 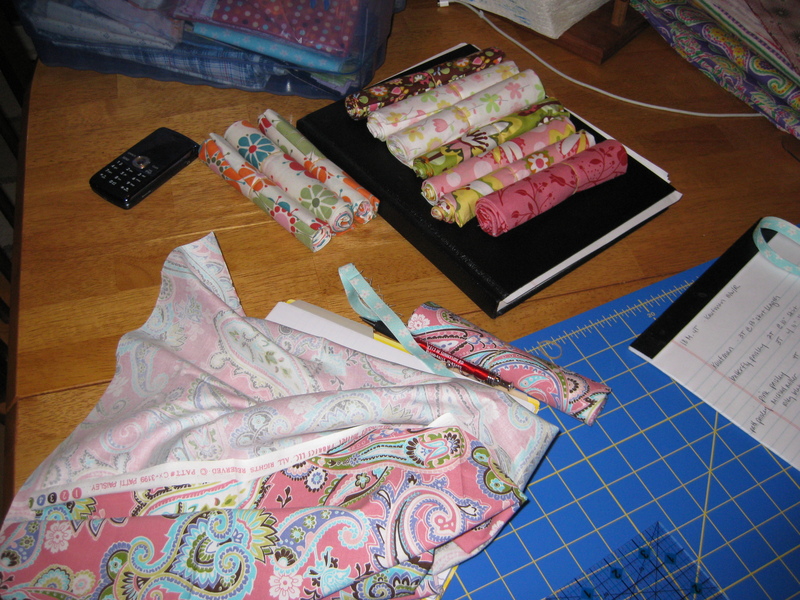 One of these days I’ll actually have everything set up so I can be creative in my sewing room. Right now I work at the kitchen table so that I can be (somewhat) social with my husband. Thanks for stopping by. Check out the gallery to see pictures of my items in action and check back often for sneak peaks of things to come!